It was the first snowfall of the winter but it didn't deter the Avon View High School Options and Opportunities (O2) students from coming out and doing some hard work on the Westbrook Trail in Avondale on November 14, 2014. Volunteers from the Avon Peninsula Watershed Preservation Society and the West Hants Trail Association provided guidance to the group of 18 students. 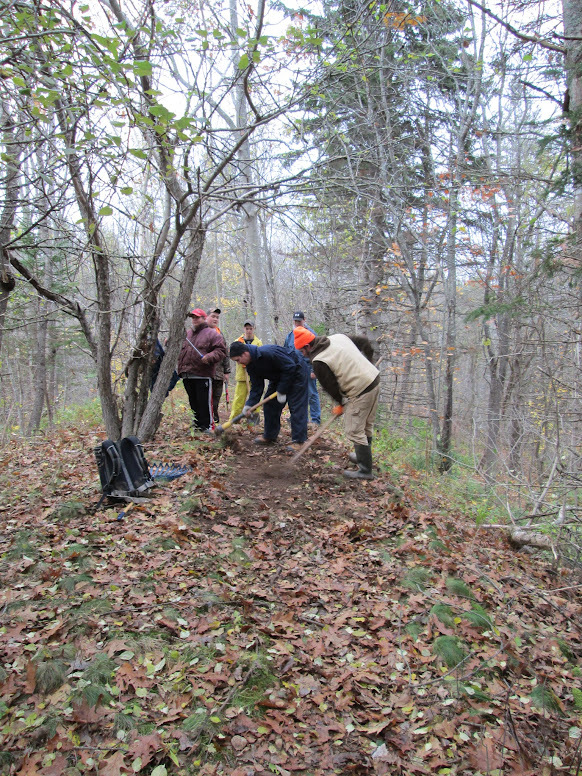 Divided into small work parties with tools in hand the students leapfrogged down the trail to sections that needed attention. 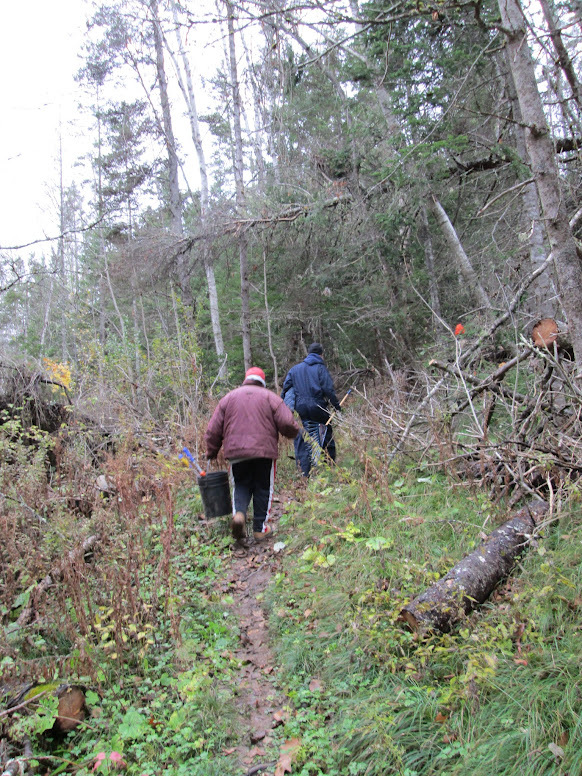 In some cases the work was fairly simple removal of tree limbs and branches that were growing into the trail. Other sections involved extensive rehabilitation in the form of bench cutting and widening of the trail to counteract a common trail problem of downhill migration of the trail tread. The group did some major trail clearing, benching and stump removal on a new section of trail that extends northwards from the “Y” bridge eventually joining onto to the old railway bed that in the early 1900's connected Newport Landing to a gypsum quarry located on the western half of the Avon Peninsula. This new section loosely follows the West Brook through several distinct areas from seasonally flooded lowlands to regrowing logging land. 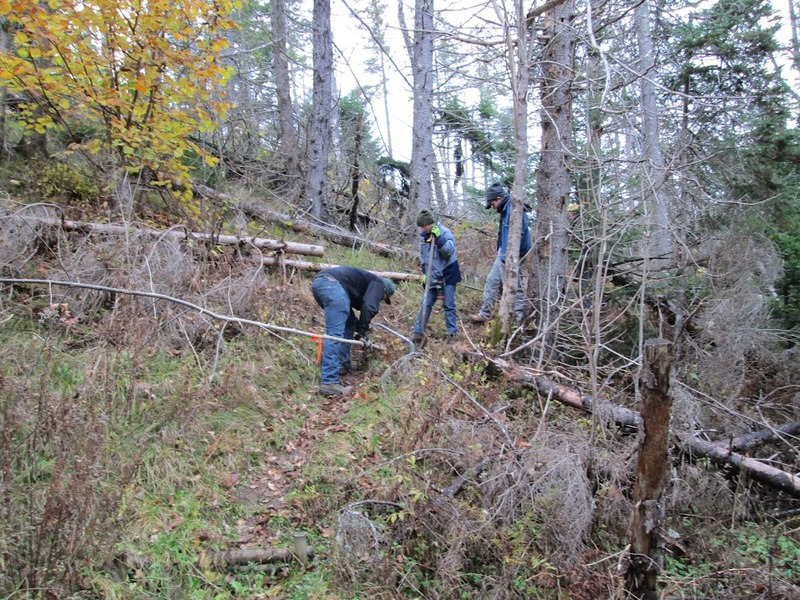 Without many of the planned bridges in place the students navigated through very wet trail sections clearing brush and filling potentially ankle twisting holes between exposed tree roots. Overall the day was a great success. After 4 hours, 5cm of snow and a couple of broken tools the original trail received some needed upgrades and the new trail, while still a work in progress, is walkable. Stay tuned for an updated trail map release in the trails section of our website once this trail is officially open. At this point the new loop connects back to the Avondale Hall on the Avondale Cross Rd for 600 meters. The plan for the future is to have the trail connect to the vineyard at the Avondale Sky Winery where a second trail head will be established. The APWPS and the WHTA would like to thank Sean Connoll and his students from the O2 program for putting in a truly amazing effort in less than ideal weather conditions.